Kinokuniya NYC is located in the heart of midtown Manhattan, directly across the street from Bryant Park and the famed New York Public Library. Kinokuniya is a full-service bookstore with three floors of books in Japanese and English. 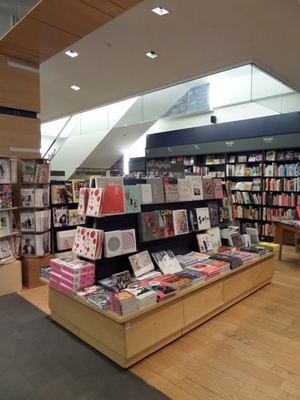 It offers a comprehensive selection of Japanese magazines, along with popular international magazines and journals in English, and its stationery department is home to the finest pens, paper, notebooks and planners from Japan. Kinokuniya NYC is part of a worldwide chain with over 80 stores. It shares the vision set forth by its original founders: a bookstore is a center for the promotion of arts and culture. Kinokuniya holds true to these values by offering a wide range of titles concentrated in the humanities, art, photography, literature, and history. Beautifully designed, Kinokuniya NYC provides a spacious, open feel for browsing, as well as for enjoying events.